What to wear this week- These boots are made for walking! and that's just what they'll do, one of these days these boots are gonna walk all over YOU! This morning I had a craving to look at some new boots, and with the fast changing season way up here, I better start crackin soon! I love boots for the simple reason of layering. It looks good AND is practical when you are stomping through 3 feet of snow! 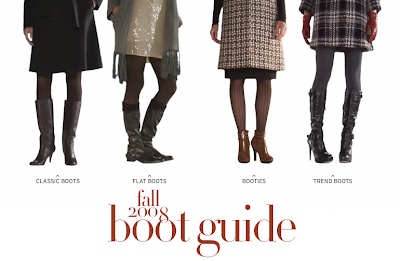 Nordstrom's Boot guide is pretty nifty, I will admit, that most of the boots on there are way out of my price range, but they do have a good variety of prices and styles that are more affordable. 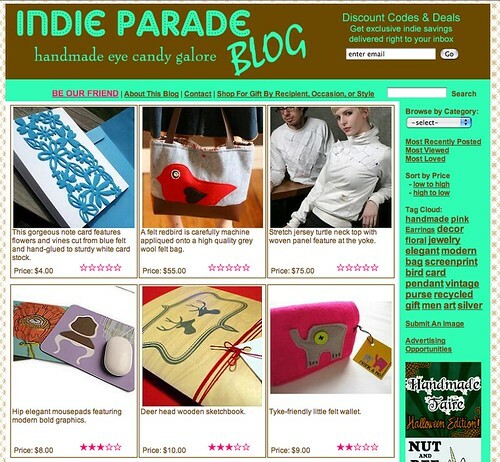 I am on Indie Parade! It looks like you can kind of vote or give the product 5 stars to give it a good rating. I would appreciate if you would give me a good rating! At first I didn't realize that the stars are click able and accidentally only gave myself 1 star! ooopps! Vote right here. I am also working on some new business cards! Let me know what you think of these designs. I was thinking of doing a bunch of patterns and mixing them all together. Hopefully I won't get bored with them! What to wear this week- Scour the sales rack! Ahhh, it is that time of year again. Time to start going on trips to look at the fall leaves and bake apple pies. 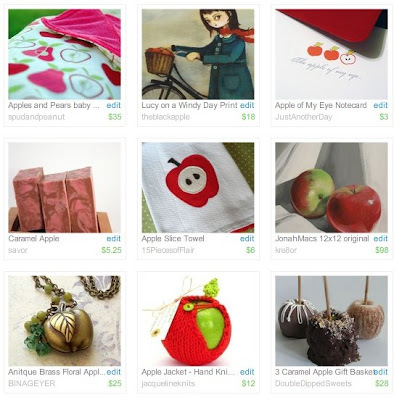 That is the inspiration for this apple inspired post today. I invite you go check out some of these shops for some really great products. Who wouldn't want to divulge into a caramel apple from Double Dipped Sweets or wake up to the smell of caramel apple soap in your shower from Savor? If anything is a must have, I personally think it is the black apple print. I recently received it as a present and it is beautiful. You can see all the texture and detailing from the original. A few of these things together would just make the perfect themed present! Woohoo! I made the front page of etsy yesterday! I didn't get to see my overtake of the front page but Kelly of kellybot on etsy let me know of my wonderful surprise and took a screen shot of it for me! While I didn't immediately get some sales, I did get a TON of new hearts... which I am hoping to lead into holiday sales (gosh is it already that time of year!?) And I did get a sale later that night of some other cards. Being on the front page doesn't happen all that often for me, but when it does, it is a great rush to be featured! This weeks good design is being brought to you because I LOVE TEA. And after chatting with a few fine folks from the Minnesota Etsy Street Team about tea, I needed to just write about it for a bit while I drink it! The new packaging design for Tea Forte is absolutely and simply stunning. It really brings the idea of high end gift giving to a new level. Now, I enjoy loose tea myself, the packaging alone for this tea makes me want to try it. Of course, I am a sucker for great designed packaging. Designers do what they do because of shoppers like me! I simply love the clean architectural presence of these little tea bags. 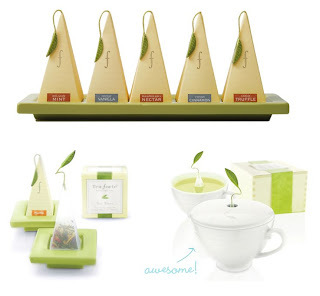 AND, not only did they come up with a great product design, they came up with accessories for your tea. They have specific cups and holders to fit your special little tea bag. This tea product manufacturer was serious abut making a whole market for its product! I could spend a long time on their website filling up my cart with o so delicious tea products! The Dieline Blog (a HUGE favorite of mine) has some great comments about this new tea product and its packaging. 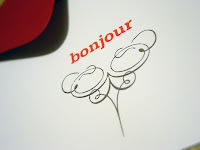 I invite you to read here! 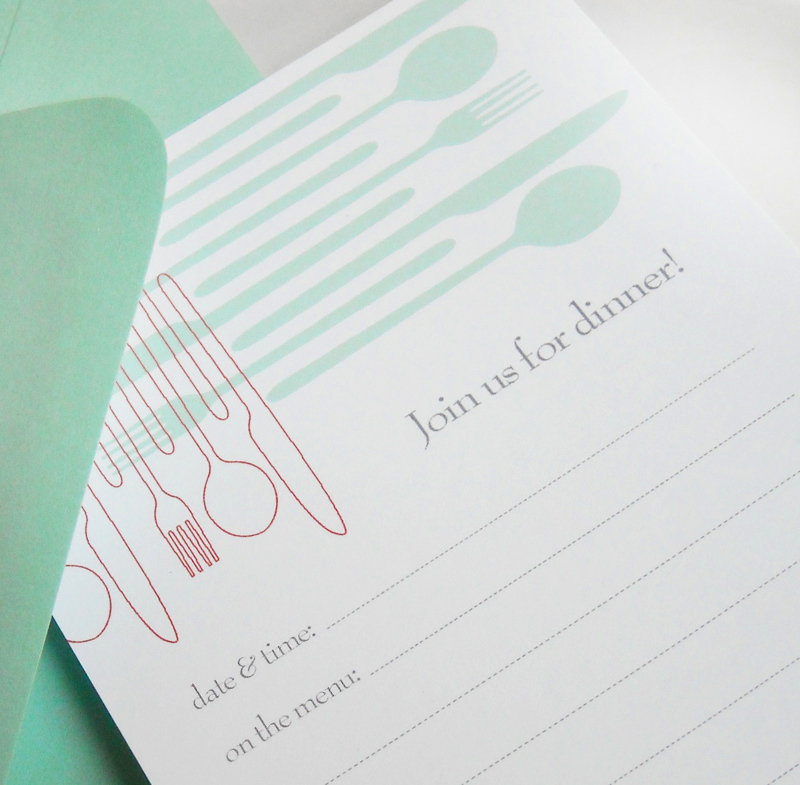 AND when you do, use these awesome dinner invites I just created! 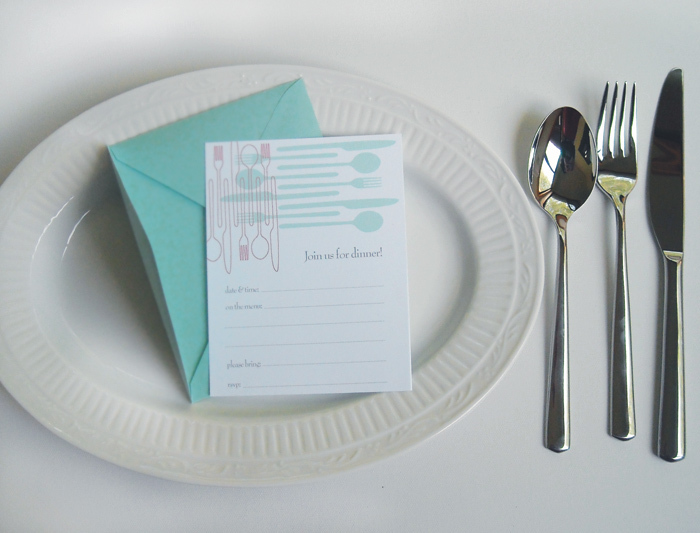 Simple and modern, these invites were designed after my brand new silverware. (yay wedding presents!) Don't you just love the color combination of aqua and red. I seem to not be able to get enough of it in my designs! What are you waiting for? Pick up dinner invites just so you have a reason to party! 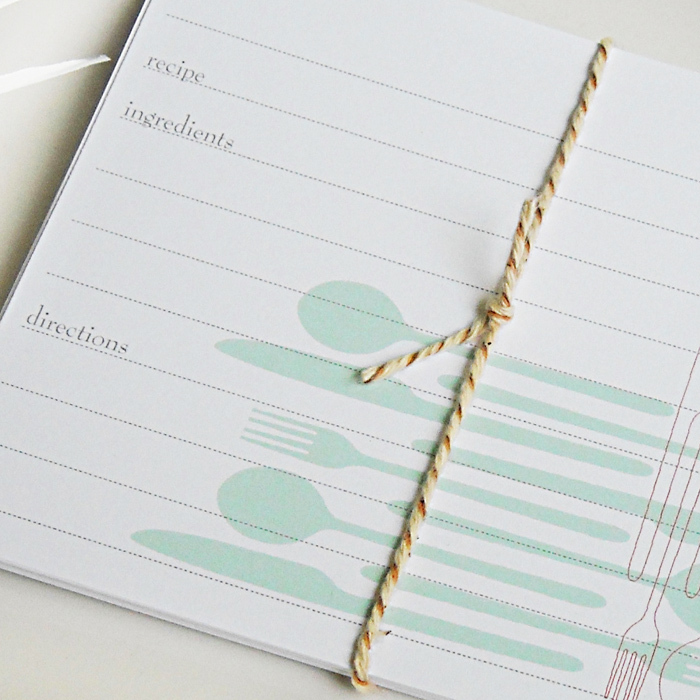 PS-When throwing your party give the recipe of one or two of your dishes to the guests with the matching recipe cards also in my shop! Sure to please any guest that comes by to eat! I just looooove the Mad Men series. absolutely. love. it. Not only is there amazing emmy nominated writing. Each week captivates us while the plot thickens and each character becomes more undone. Not only is the writing and talent amazing for this show but the set design and fashion is so hot right now. I have been a big fan of vintage and retro inspired looks for some time (hello retro ladies!) 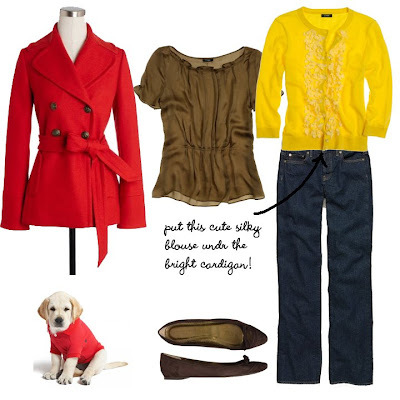 and thought I would bring some fun fashion your way this week inspired by the character Jane. For a fabuous party try this white dress by Nine West or this dress by Issac Mizrahi (both under $100!) top both looks off by wearing a cropped cardigan over the dresses! 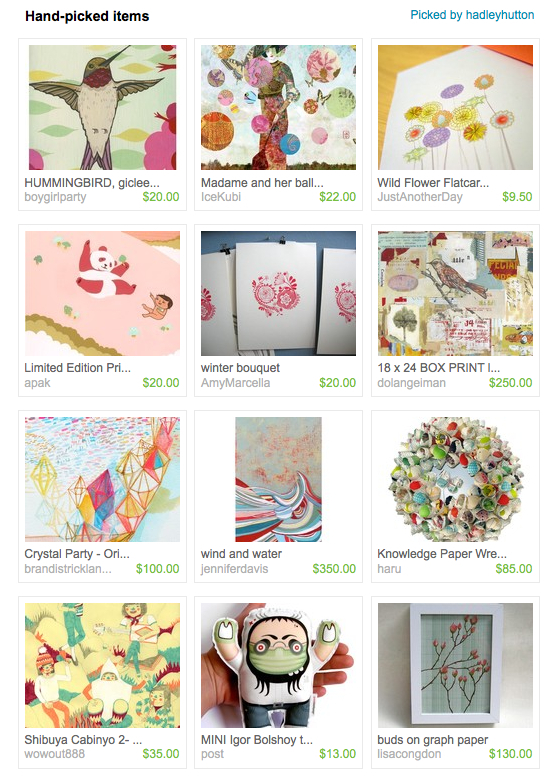 Every Friday will now feature my finds from indie arts around the world. I will have a theme to tie in all the great things I feature! This Friday I am featuring a few artists that I did a card swap with. 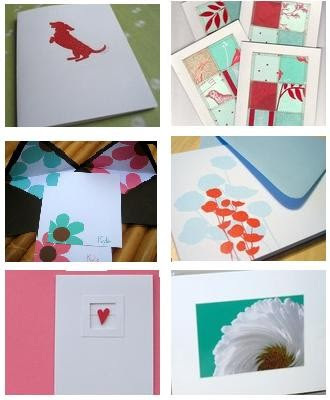 The theme is Red and Teal Greeting Cards. They all look so lovely together! I finally finished my 'What's New' Page on my website! I am going to highlight new products as I create them and also show a bit on my process of how I create. I will be changing the page out about every two weeks as I get new looks and different seasons come upon us! Let me know what you think! Holy shmoly. When I saw these on the apple site I just fell in love. Don't you just loooove the RICH, BRIGHT, IN YOUR FACE colors of the new nanos? If I weren't so obsessed over getting an ipod touch I would get this beautiful blue nano... or quite possibly this kelly green... OR the bright orange color. dang. so cute! In the future, every Wednesday will be dedicated to finding good design in the world. It might mean product design (like these fabulous little nanos) or graphic design, furniture design ect. If you have something you think is a fabulous design feel free to leave a comment or email me! Since I have more time to work on things I have been busy creating new designs for my wedding invitation collection. 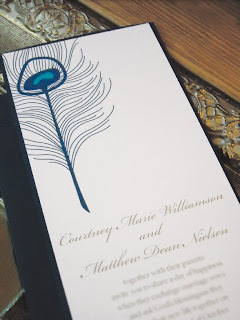 Here is one of the first ones I printed up, the Luxurious Peacock Invitation. The peacock feather was first drawn by hand and then scanned into the computer before coloring it. I think the large illustration creates a dramatic effect. I love the simple turquoise paired with the navy blue of the backing and envelopes. 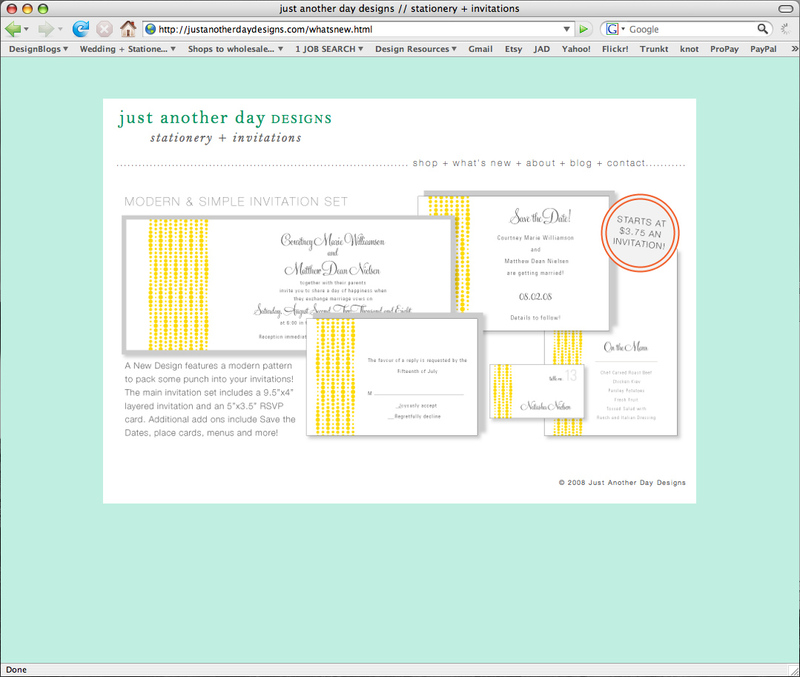 Of course, like all my invitations, you can customize your colors to best suite your wedding! They are available in my shop now. What to Wear this Week? Every Monday I will be posting a bit of fashion to start out your week! I am going to do my best to bring you fashionable ideas that are for the budget conscience! It is a huge pet peeve of mine when I look on the internet, read the fashion mags and find something that I just adore only to find out that it costs more than $200!!! Yikes! So today I bring you fashion from the always trendy but never burns a hole in your wallet H&M. I love all the new looks, especially the layers and coats. Their pallet this fall is so rich and luxurious. You will definitely look expensive wearing a few of these pieces to work or out on the town! And living in Minnesota, you can NEVER have too many coats to keep you warm.... or looking good! Here is a collage of a few of my favorite pics! I will add some more throughout the weekend as well! 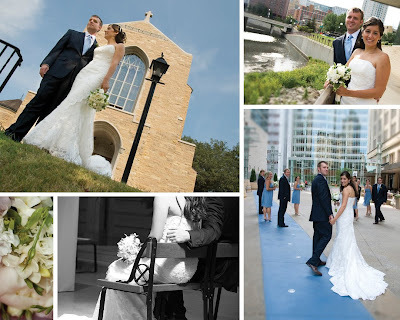 Our photographer is Marnie of Marnie Meylor Photography. Isn't her work amazing! I will post her info as soon as I get it all! Okay okay, before I get to the wedding pics... 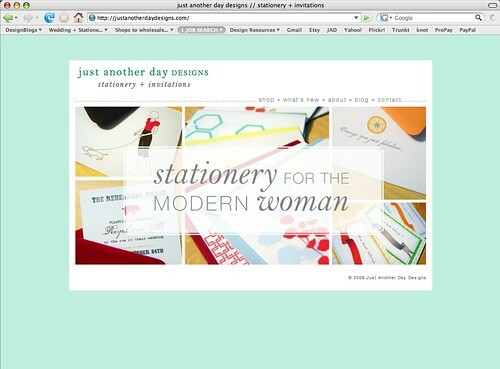 I just have to share with you my TOTALLY revamped website! I designed and created it all myself so there are a few kinks to work out, but I am pretty proud of what I did in a day! I got some really great feedback on it so far and I am busy making a few slight adjustments to the pages AND I have a stellar idea for the what's new page! stay tuned! I am going to start featuring other designers and fun daily finds in a regular line up that I am working through, so if you would like to be featured sometime, comment with your info and I will take a look at your products! I have been busy working on new fall items as well, so be sure to check back often with my product updates! If you are interested in getting my newsletter with updates and special discounts post a comment with your email address!